Rainford Tennis Club have presented a special award to Dianne Murphy for her support of schools tennis in St Helens. Dianne, in her role as Partnership Development Manager based at Haydock Sports College, has co-ordinated the schools tennis programme across St Helens for the past seven years. During this time hundreds of children have been introduced to tennis coaching and competitions, which has benefitted Rainford Tennis Club and the other Tennis Clubmark venues in the town. “We are very grateful for the support Dianne has given to the sport of tennis” said Helen Bligh, Chairperson of Rainford Tennis Club. 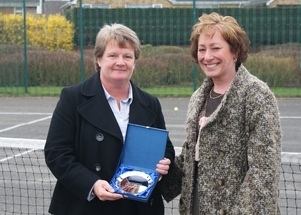 Dianne is pictured (left) receiving her award from Helen Bligh at the Spinney Park in Rainford as part of the programme being awarded AEGON Parks Tennis Beacon status from the LTA and Tennis Foundation.